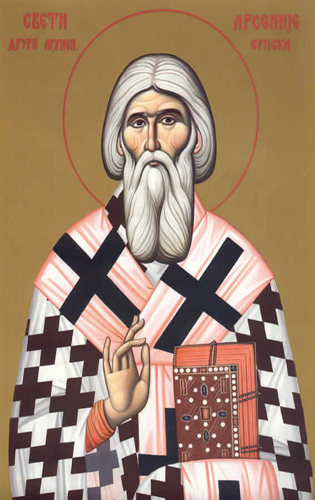 A great hierarch of the Serbian Church and the successor of St Sava, Arsenius was born in Srem.He became a monk while still a young man, and gave himself to wholehearted asceticism for his soul's salvation. Hearing of the wonderful personality and deeds of St Sava, Arsenius went to him at Zica, where the saint received him with kindness and drew him into the brotherhood at the monastery. Seeing rare virtues in Arsenius, Sava soon installed him as abbot of the Zica community. When the Hungarians over-ran the land of Serbia, Sava sent Arsenius south to find a more secluded spot for the archiepiscopal seat. Arsenius chose Pec, and there built a monastery and church to the Holy Apostles, which later became dedicated to the Lord's Ascension. Before his second departure for Jerusalem, Sava designated Arsenius to succeed him on the archiepiscopal throne and, when Sava died at Trnovo on his way home, Arsenius urged King Vladislav to take Sava's body onto Serbian soil. He governed the Church wisely for thirty years, and entered into rest in the Lord on October 28th 1266. On the wall of the altar at Pec is written: 'O Lord our God, hearken; visit and bless this church ...remember it, and me, the sinner Arsenius'. St Arsenius's relics are now in the monastery of Zhrebaonik in Montenegro.